NixOS 16.09 “Flounder” has been released, the sixth stable release branch. See the release notes for details. You can get NixOS 16.09 ISOs and VirtualBox appliances from the download page. For information on how to upgrade from older release branches to 16.09, check out the manual section on upgrading. NixOps 1.4 has been released. This release contains contains many nice new features. See the manual for details. NixOS 16.03 “Emu” has been released, the fifth stable release branch. See the release notes for details. You can get NixOS 16.03 ISOs and VirtualBox appliances from the download page. For information on how to upgrade from older release branches to 16.03, check out the manual section on upgrading. Nix 1.11 has been released. See the release notes for a list of changes and new features. NixOS 15.09 “Dingo” has been released, the fourth stable release branch. See the release notes for details. You can get NixOS 15.09 ISOs and VirtualBox appliances from the download page. For information on how to upgrade from older release branches to 15.09, check out the manual section on upgrading. Nix 1.10 has been released. See the release notes for a list of changes and new features. We're happy to announce that NixCon 2015, the first Nix Conference, will take place on November 14—15th 2015 in Berlin. For more information, see the NixCon website. And please consider submitting a talk! The NixOS Foundation was started to improve our ability to maintain and extend the infrastructure used by the Nix related projects. If you would like to support us, please go here and donate some money! Nix 1.9 has been released. See the release notes for a list of changes and new features. NixOS 14.12 “Caterpillar” has been released, the third stable release branch. 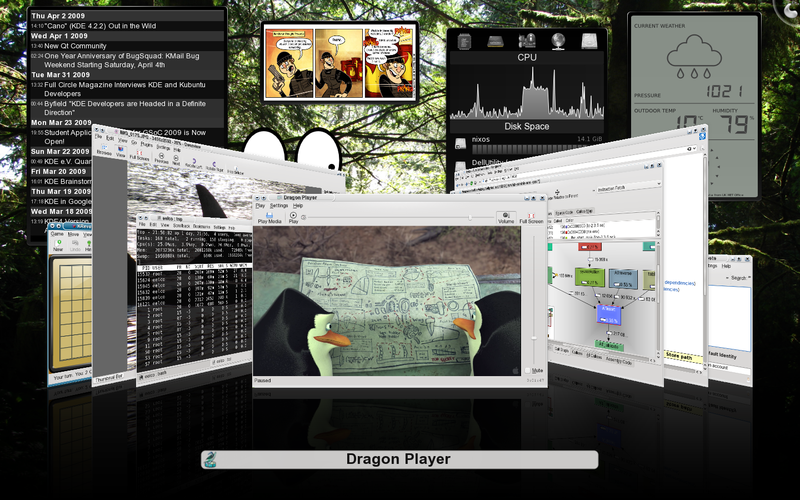 It brings Linux 3.14, systemd 217, Glibc 2.20, KDE 4.14.1, and much more. See the release notes for details. You can get NixOS 14.12 ISOs and VirtualBox appliances from the download page. For information on how to upgrade from older release branches to 14.12, check out the manual section on upgrading. Nix 1.8 has been released. See the release notes for a list of changes and new features. We’re having a NixOS sprint at the Kiberpipa hackerspace in Ljubljana, Slovenia, on August 23—27. Joining is free! For more information and to register, please go to the sprint page. NixOS 14.04 “Baboon” has been released, the second stable release branch. 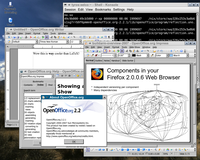 It brings Linux 3.12, systemd 212, GCC 4.8, Glibc 2.19, KDE 4.12, light-weight NixOS containers, and much more. See the release notes for details. You can get NixOS 14.04 ISOs and VirtualBox appliances from the download page. For information on how to upgrade a 13.10 system to 14.04, check out the manual section on upgrading. NixOps 1.2 has been released. This release contains contains many nice new features. See the manual for details. Nix 1.7 has been released. See the release notes for a list of new features. If this shows any OpenSSL version prior to 1.0.1g, you may be vulnerable. Domen Kožar gave a talk at FOSDEM about NixOS (video). Also, Ludovic Courtès gave a talk on Guix, the Nix- and Guile-based package manager. The stdenv-updates branch has been merged into the master branch of Nixpkgs. The main change are that brings is that Nixpkgs/NixOS are now based on GCC 4.8 and Glibc 2.18, in addition to many smaller updates. We have released NixOS 13.10, the first stable branch of NixOS. Its goal is to provide a safe branch for production environments that need bug fixes and security updates, but not the potentially destabilising changes that sometimes occur on the unstable branch. You can get NixOS 13.10 ISOs and VirtualBox appliances from the download page. See the announcement for more information. For information on how to switch an existing NixOS machine from the unstable channel to 13.10, check out the manual section on upgrading. Nix 1.6.1 has been released. This is primarily a bug fix release but has some minor new features. See the release notes for details. The NixOS Git tree has been merged into the Nixpkgs tree in order to simplify development. The sources now live in the nixos subdirectory of the Nixpkgs repository on GitHub. See the announcement for more information. NixOps 1.1.1 has been released. This release consists mostly of minor bugfixes. See the manual for details. Nix 1.6 has been released. See the release notes for details. NixOps 1.1 has been released. This release brings a backend for Hetzner, a German data center provider, support for EC2 spot instances and some minor bugfixes. See the manual for details. A sprint focused on NixOS and Kotti will be held 22-26 July 2013 in Lokve, Slovenia. It is organised by Termitnjak and sponsored by LogicBlox. NixOps 1.0.1 has been released, a minor bug fix release. See the manual for details. Domen Kožar gave a presentation at EuroPython 2013: “NixOS Operating System: Declarative Configuration Distribution”. NixOps 1.0 has been released, the inaugural release of the NixOS cloud deployment tool. See the announcement and the manual for details. Nix 1.5.3 has been released. This is primarily a bug fix release. See the release notes for details. Today Sander van der Burg successfully defended his PhD thesis entitled A Reference Architecture for Distributed Software Deployment! It describes (among other things) Disnix, a system for deployment of service-oriented architectures. Nix 1.5.2 has been released. This is a bug fix release. Nix 1.5.1 has been released. It fixes a regression introduced in Nix 1.4. See the release notes for details. Nix 1.4 has been released. This is primarily a bug fix release that addresses a security problem in multi-user mode. See the release notes for details. For installation information, see the manual. Nix 1.3 has been released. This is primarily a bug fix release. See the release notes for details. For installation information, see the manual. Nix 1.2 has been released. See the release notes for details. For installation information, see the manual. Nix 1.1 has been released. See the release notes for details. For installation information, see the manual. Our continuous build system, Hydra, now produces binary tarball distributions of Nix for Mac OS X (Darwin), FreeBSD and Linux. The tarballs contain all dependencies of Nix, making it a lot easier to install Nix on those platforms. To install, download a binary tarball, unpack it in the root directory, then run nix-finish-install. See the manual for more information. After almost two years of development, Nix 1.0 has been released. See the release notes for an overview of the most important improvements. For installation information, see the manual. PatchELF 0.6 has been released. Apart from some bug fixes, it adds support for executables produced by the Gold linker. See the README for details. Ludovic Courtès gave a talk on Hydra at Inria (which has its own Hydra instance for building Inria software) entitled “Hydra: continuous integration for demanding people”. The NixOS project is (slowly) migrating from Subversion to Git! The master repositories will be hosted in the NixOS organization on GitHub. 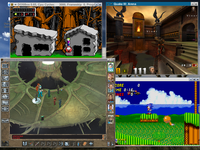 For the moment, just a few subprojects have been migrated, such as Hydra and Charon. Thanks to Tianyi Cui for donating the NixOS GitHub organization. The nix-dev mailing list has moved. The address is now nix-dev@lists.science.uu.nl (web interface). Sander van der Burg gave a talk about NixOS at the CrossDistro track of FOSDEM (video, slides). The paper “Automating System Tests Using Declarative Virtual Machines” (by Sander van der Burg and Eelco Dolstra) has been accepted for presentation at the 21st IEEE International Symposium on Software Reliability Engineering (ISSRE 2010). It describes how system tests with complex requirements on the environment (such as remote machines, network topologies, system services or root privileges) can be written succinctly using declarative specifications of the machines needed by the test environment. From these specifications we can automatically instantiate (networks of) virtual machines. This is what we use for automated regression testing of NixOS itself. A draft of the paper is available. Nix 0.16 has been released, featuring a much faster evaluator and support for configurable parallelism inside builders. See the release notes for details. For installation information, see the manual. Ludovic Courtès gave a talk about Nix and NixOS at the Libre Software Meeting in Bordeaux, entitled “NixOS: The Only Functional GNU/Linux Distribution” (slides). Nix 0.15 has been released. This is a bug fix release. See the release notes for details. For installation information, see the manual. Nix 0.14 has been released. This is primarily a bug fix release. See the release notes for details. For installation information, see the manual. Long overdue, the Nix project finally has a logo! The logo was originally created by Simon Frankau for the Haskell logo competition, who kindly gave us permission to use it for the Nix project. (The snowflake motif is even more appropriate for Nix, because nix is Latin for snow.) Any further modifications are entirely our fault. Nix 0.13 has been released. This is mostly a bug fix release, although it also adds some new language features. See the release notes for details. For installation information, see the manual. LWN.net has an article about NixOS written by Koen Vervloesem. Nixpkgs 0.12 has been released. See the release notes for details. Meanwhile, the Nixpkgs trunk has been updated to GCC 4.3.3, Glibc 2.9 and X.org 7.4. 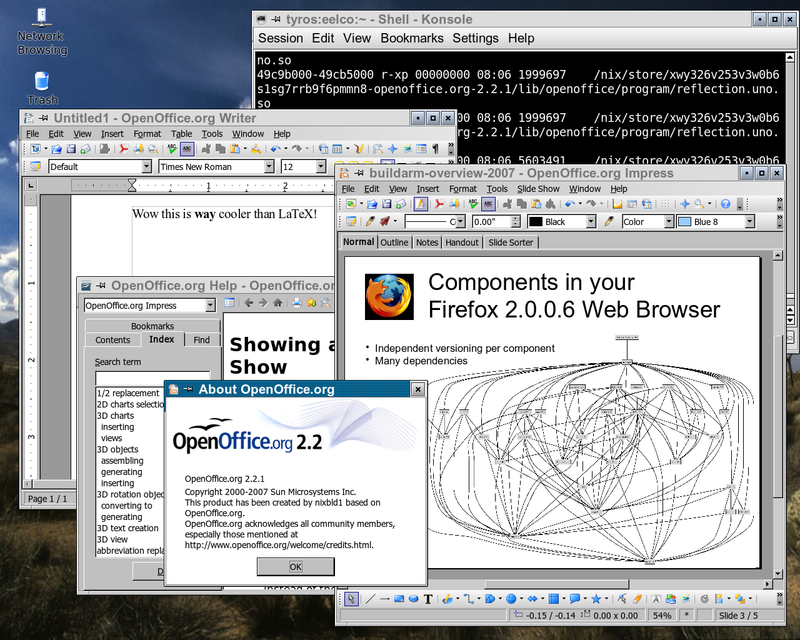 Lluís Batlle has updated OpenOffice.org in Nixpkgs to 3.0.1 (screenshot). Nix and NixOS releases are now built in Hydra, the new Nix-based continuous build system. Hydra replaces our old Nix-based build farm, which will be phased out soon. There are several advantages over the old build farm: the build tasks for a project are scheduled and published separately, so that for instance a (fast) tarball build doesn’t have to wait for a (slow) Cygwin build; build results are stored in a database, which will enable all sorts of interesting queries; better error reporting; a better web interface; and much more. We have written a draft paper about Hydra. There are some instructions available about how to set up your own Hydra server. There is an article on Linux.com about Nix: “Nix fixes dependency hell on all Linux distributions”. Nix 0.12 has been released. The most important change is that Nix no longer needs Berkeley DB to store metadata, but there are many other improvements. See the release notes for details. The paper “NixOS: A Purely Functional Linux Distribution” (by Eelco Dolstra and Andres Löh) has been accepted for presentation at the 2008 International Conference on Functional Programming (ICFP). It describes NixOS in much greater detail than last year’s HotOS paper, and argues why the purely functional style and features such as laziness are important for system configuration management. It also provides some measurements on the actual purity of Nix build actions. A draft of the paper is available. The Nix website was down for a few days due to cooling problems in the server room causing the machine to overheat. These should be resolved now. Apologies for the inconvenience. The Nix website has moved to nixos.org (hosted at TU Delft). The Subversion repositories have moved to svn.nixos.org. 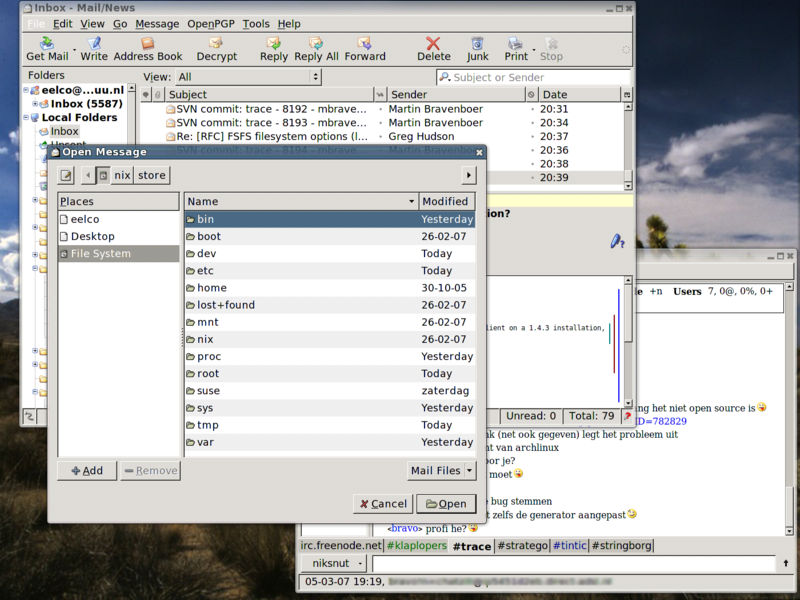 See this mailing list posting for information about moving existing SVN working copies. Eelco Dolstra presented the paper “Maximal Laziness — An Efficient Interpretation Technique for Purely Functional DSLs” at 8th Workshop on Language Description, Tools and Applications (LDTA 2008). It’s about caching of evaluation results in the Nix expression evaluator as a technique to make a simple term-rewriting evaluator efficient. Slides are here. The Jacquard program of NWO and EZ has granted funding for the Nix-related project “Pull Deployment of Services” (PDS), which is about improving the deployment of software and services in complex heterogenous environments. The grant consists of 368 K€ for a PhD student (4 years) and a postdoc (3 years). If you’re interested in these positions, please have a look at this page, and don’t hesitate to contact Eelco Visser or Eelco Dolstra. New NixOS installation CD images for i686 and x86_64 are available, which is a good thing as the previous ones were already a few months old. The new images are Nix 0.11-based, contain Memtest86+ as a convenience, should support more SATA drives, and show online help (the NixOS manual) on virtual console 7. Nix 0.11 has been released. This is a major new release representing over a year of development. The most important improvement is secure multi-user support. 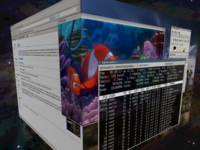 It also features many usability enhancements and language extensions, many of them prompted by NixOS, the purely functional Linux distribution based on Nix. See the release notes for details. Nixpkgs 0.11 has been released. See the release notes for details. 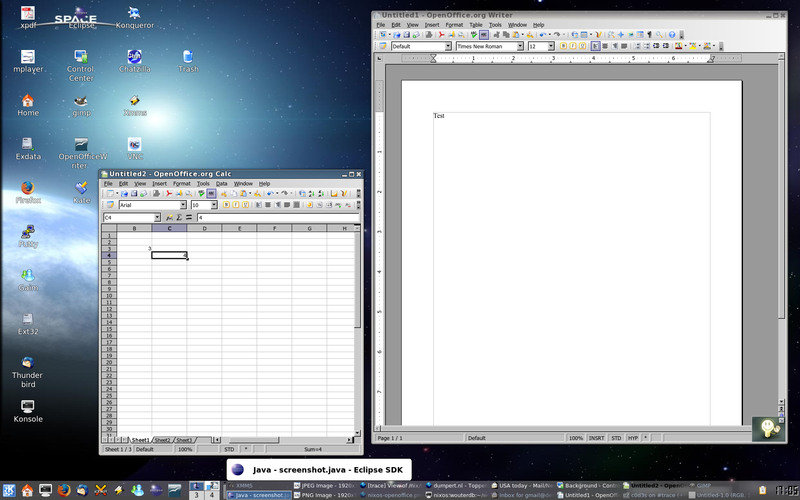 OpenOffice is now in Nixpkgs (screenshot of OpenOffice 2.2.1 running under NixOS, and another screenshot). 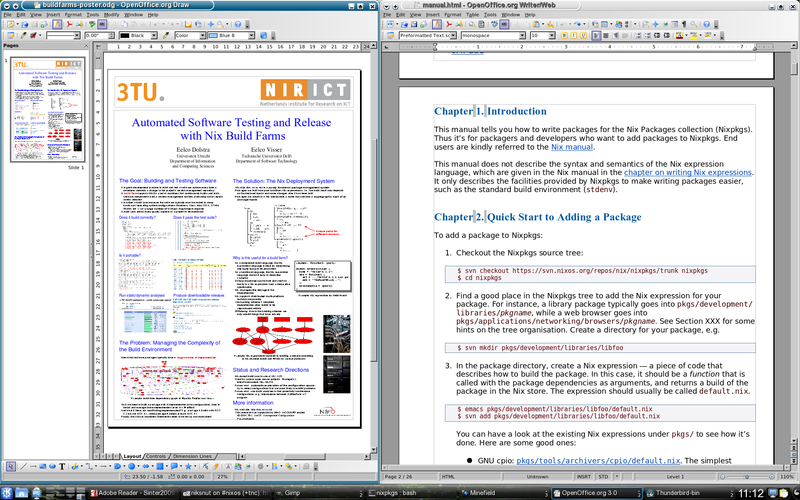 Despite being a rather gigantic package (it takes two hours to compile on an Intel Core 2 6700), OpenOffice had only two “impurities” (references to paths outside of the Nix store) in its build process that had to be resolved — a reference to /bin/bash and one to /usr/lib/libjpeg.so. Armijn Hemel, Wouter den Breejen and Eelco Dolstra contributed to the Nix expression for OpenOffice. Wine now runs on NixOS! Finally we can run all those legacy applications... Thanks to Michael Raskin for adding Wine and a NPTL-enabled Glibc (which Wine seems to need). This is a nice application of purely functional package composition, by the way: Wine didn’t work with the standard Glibc in Nixpkgs, so we just pass it another Glibc at build time. In other news, Nix 0.11 and Nixpkgs 0.11 will be released soon. There is now a mailing list (nix-commits@cs.uu.nl) that you can subscribe to if you want to receive automatic commit notifications from the Nix Subversion repository. Eelco Dolstra presented the paper Purely Functional System Configuration Management at the 11th Workshop on Hot Topics in Operating Systems (HotOS XI). It gives an overview of the ideas behind NixOS. The slides are also available. 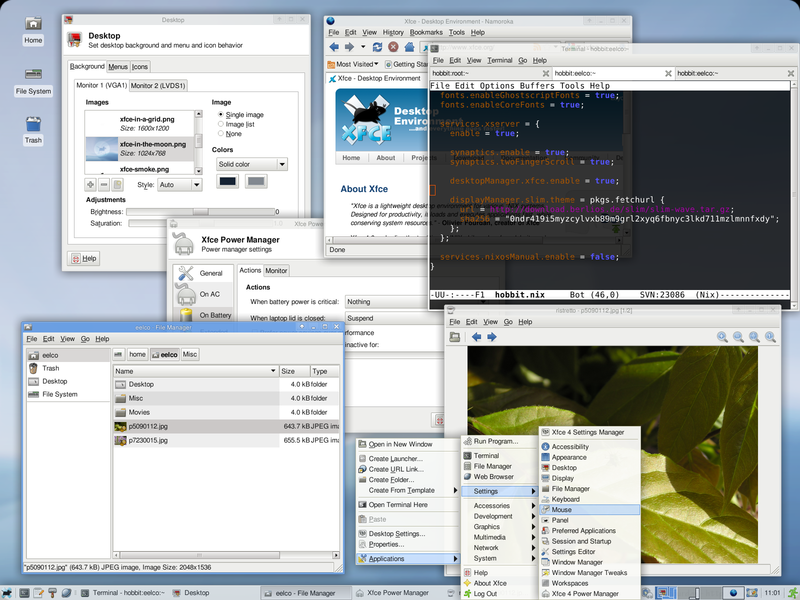 We now have KDE running on NixOS (obligatory screenshot). 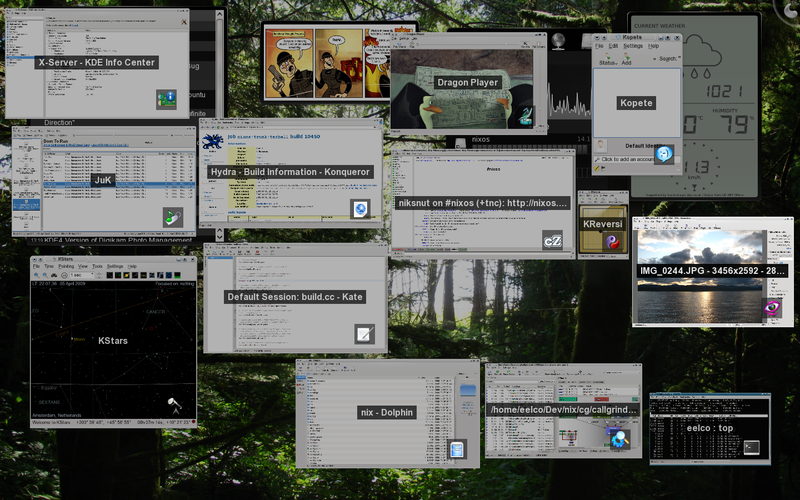 Just kdebase for now (Martin Bravenboer already added kdelibs a long time ago so that we could run the wonderful KCachegrind), but it contains all the important stuff (Konqueror, KDesktop, Kicker, Konsole, Control Center, etc.). In related news, we can safely say that, rumours to the contrary notwithstanding, NixOS is not an April Fools’ Joke. X server with Compiz window manager. 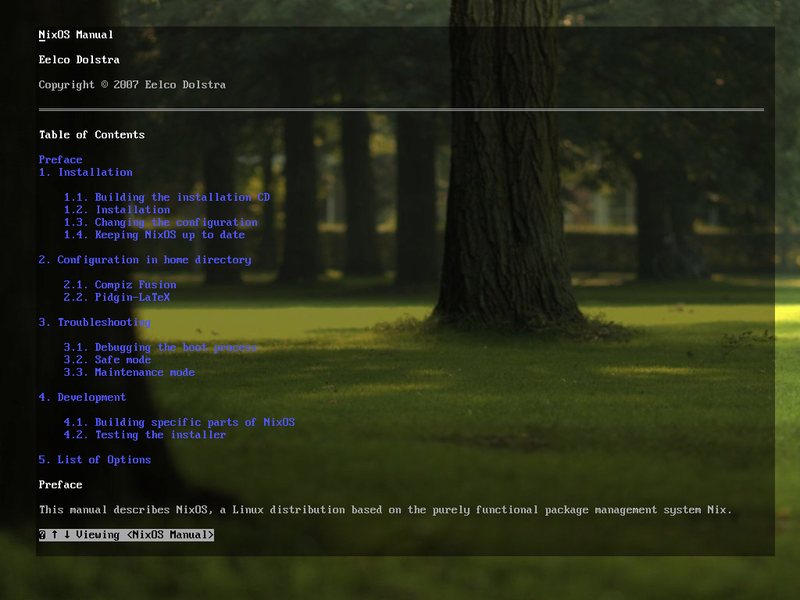 Emacs and a few terminals showing off the (near) absence of /lib, /bin etc. ; everything is in the Nix store. There is now some basic documentation for NixOS. NixOS now works on x86_64 machines. A 64-bit ISO is available. To quote Eelco Visser: new hardware for buildfarm at Delft University of Technology has arrived. Here’s what we have: 5 Intel Core 2 Duo DualCore machines with 1GB RAM, 2 Mac minis with 1,83-GHz Intel Core Duo-processor, another Core 2 Duo a UPS to deal with spikes in power supply, a console with integrated monitor and keyboard switches, a rack with room for a couple more machines. Nixpkgs 0.10 has been released. See the release notes for details. Nix 0.10.1 has been released. It fixes two obscure bugs that shouldn’t affect most users. Nix 0.10 has been released. This release has many improvements and bug fixes; see the release notes for details. Nixpkgs 0.9 has been released. Eelco Dolstra defended his PhD thesis on the purely functional deployment model. Nix 0.9.2 has been released released. This is a bug fix release that addresses some problems on Mac OS X.
Nix 0.9 has been released. This is a new major release that provides quite a few performance improvements and bug fixes, as well as a number of new features. Read the release notes for details. The paper “Secure Sharing Between Untrusted Users in a Transparent Source/Binary Deployment Model” has been accepted at ASE 2005. This paper describes how a Nix store can be securely shared by multiple users who may not trust each other; i.e., how do we prevent one user from installing a Trojan horse that is subsequently executed by some other user? The paper “Service Configuration Management” (accepted at the 12th International Workshop on Software Configuration Management) describes how we can rather easily deploy “services” (e.g., complete webserver configurations such as our Subversion server) through Nix by treating the non-component parts (such as configuration files, control scripts and static data) as components that are built by Nix expressions. The result is that all advantages that Nix offers to software deployment also extend to service deployment, such as the ability to easily have multiple configuration side by side, to roll back configurations, and to identify the precise dependencies of a configuration. The paper “Efficient Upgrading in a Purely Functional Component Deployment Model” has been accepted at CBSE 2005. It describes how we can deploy updates to Nix packages efficiently, even if “fundamental” packages like Glibc are updated (which cause a rebuild of all dependent packages), by deploying binary patches between components in the Nix store. Includes techniques such as patch chaining and computing deltas between archive files.